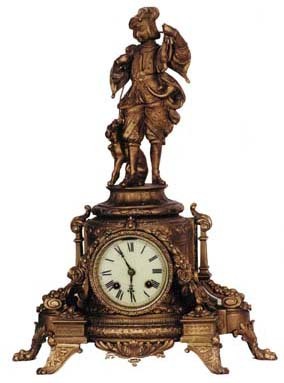 Ansonia Clock Co. "Olympia" clock and base with an unidentified Ansonia statue of unusual style. The large base is 15 1/2 inches wide and with the statue stands 21 inches high. The metal case and statue have a heavy coat of what the catalogs call "Real Bronze" finish. It aged well and then was buffed in spots to give it a good look. The statue of boy and dog make the clock. 8-day movement strikes a gong on half hours. The movement is a lever and is running. See Ly-Ansonia No.1496 for picture of Olympia base.